The Chappelear Design Studio (upstairs, above the set workshop) has an Epson PowerLite 935w projector with the capability to project without connecting a video cable. Here are instructions for using it. 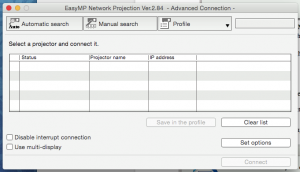 Epson EasyMP Network (Wireless) Projection is required. 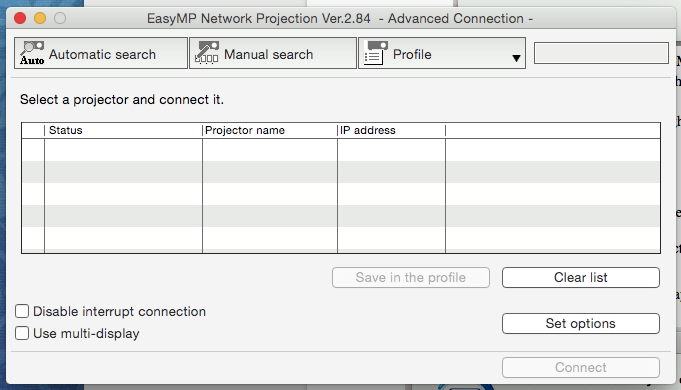 2) Download the EasyMP Network Projection software for your Mac or PC. 3) Install it on your computer, then follow the instructions below. If you do, click OK and use the laptop speakers. 3) If asked, select Advanced Connection Mode. 5) Click the Connect button at bottom right. Your computer screen should now appear on the projected screen. Set options: Transmission performance during the transfer of computer images can be adjusted. Disconnect: Disconnects the connection to the projector. 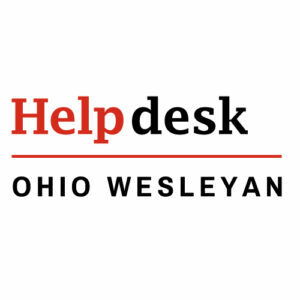 Switch toolbar display: The toolbar display may be switched between Full, Normal, and Simple.